Everyone has their favorite cluster of squadmates for multiplayer get togethers: it definitely beats sitting around waiting for some random pubbies to join. Activision released a CoD: WWII trailer today that does a brilliant job of recreating the feeling of getting the old team back together for something new and exciting. Now, while this particular squad seems a little… overpopulated… It’s got everyone at TeamSCUF excited to gather their teammates and decimate the battlefields in Call of Duty: WWII. November’s right around the corner, and we are pumped. With Call of Duty: WWII getting its full release on November 3, it makes sense that gamers all over the world are desperate for some boots on the ground competition. 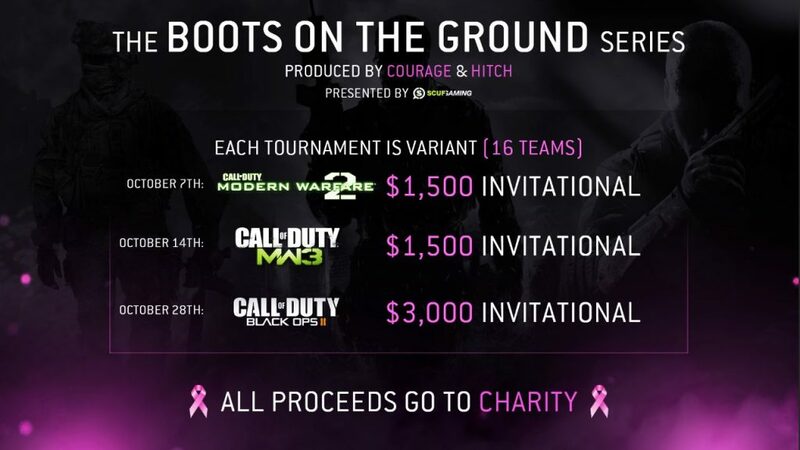 And to satisfy that need for some classic run and gun action, Scuf Gaming is proud to host the Boots On The Ground Series by Courage and Hitch! Featuring three invite-only competitions, the Boots On The Ground series is a perfect opportunity for CoD fans to watch some of their favorite players tickle those nostalgia glasses with multiplayer mayhem from Modern Warfare 2, Modern Warfare 3, and Black Ops 2. The event begins this weekend with Modern Warfare 2, and continues all the way to the end of October. And the best part? All proceeds from the BOTG Series are going to charity! Considering the fact that Scuf Gaming has its roots in boots on the ground combat, this is a competition that is close to the hearts of everyone at SCUF HQ. 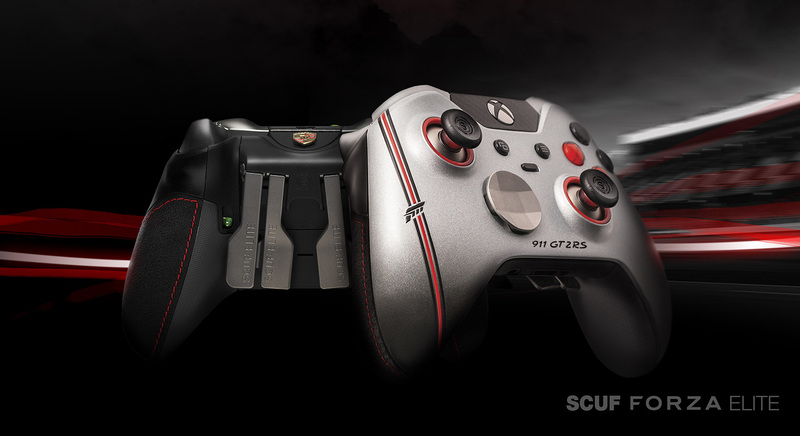 It was thanks to that style of multiplayer that terms like “SCUF Jump” and “SCUF Knife” have become household names since SCUF’s founding in 2011. Be sure to visit Courage and Hitch’s Twitch channels to catch all the throwback fun! 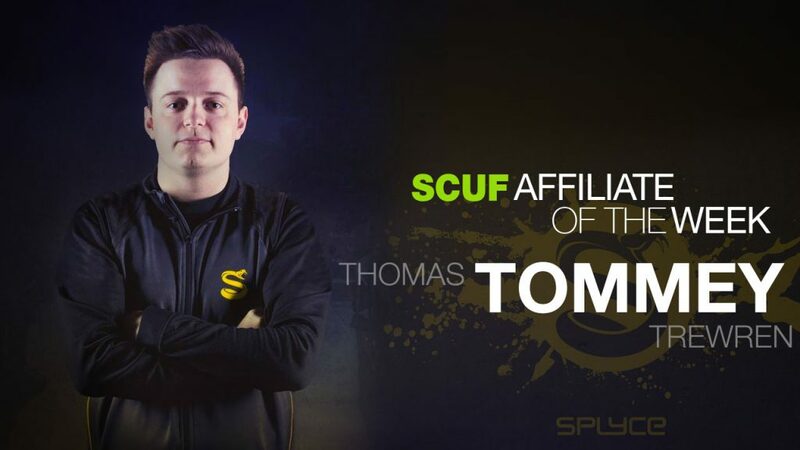 This week’s affiliate profile takes a look at one of Europe’s most storied players, and the most recent addition to the Splyce Call of Duty squad – Thomas ‘Tommey’ Trewren. Tommey is one of the most veteran European players still competing today. Having competed in the very first ECL event – prior to the organiser rebranding to EGL for events four and onwards – there are very few who can boast longer tenure at the elite level of European Call of Duty than Tommey. 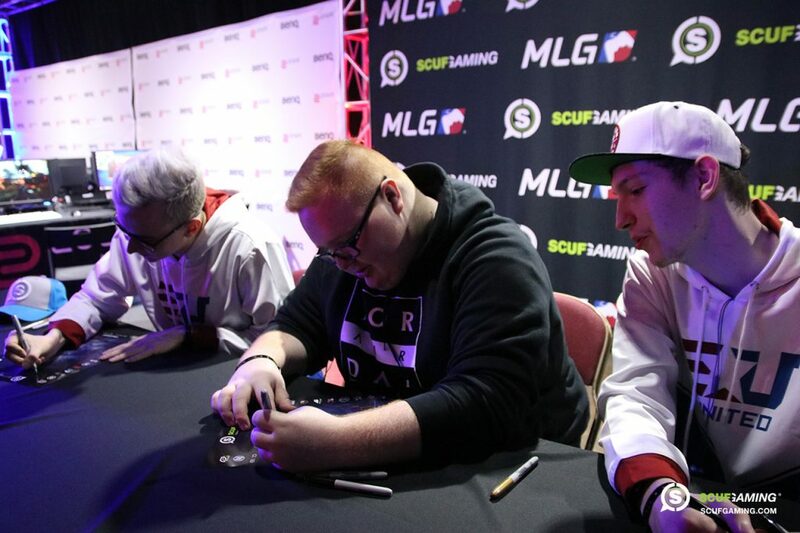 Throughout his time competing, Tommey has been a near constant presence at the highest level within the region. He’s played alongside almost every great player Europe has ever produced, and represented almost all of the most storied organisations. In Infinite Warfare, in a rare departure from competing alongside the established elite, Tommey built a brand-new roster of largely inexperienced players under Fnatic. 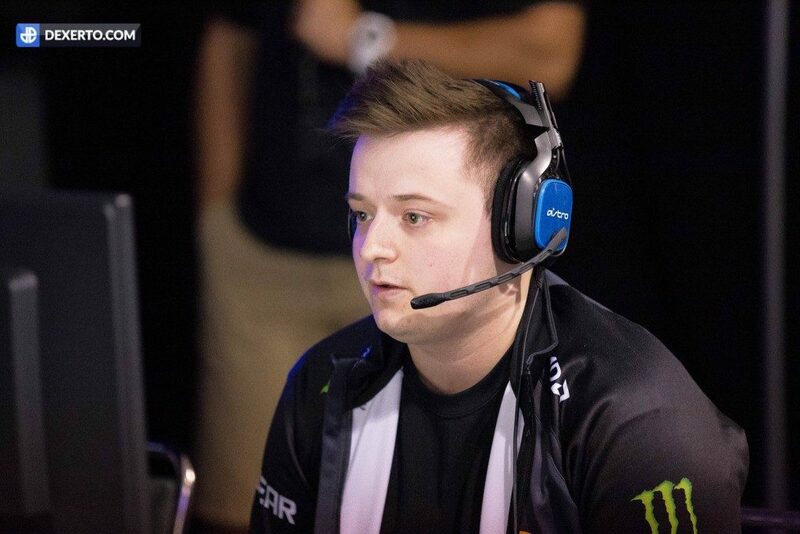 Though it was the first full season of Tommey’s career without a championship, it was nevertheless a demonstration of the impact he was still capable of, leading a team that arguably had little business being there in such a competitive season to a peak of a top-six placement at the Global Pro League Stage Two Playoffs, one of the biggest tournaments of the year. Following a transfer in the off-season ahead of Call of Duty: WWII, Tommey is now a member of Splyce, replacing a departing Trei ‘Zer0’ Morris. In Infinite Warfare, Splyce were the most successful European squad, winning a historic title at the Global Pro League Stage One Playoffs and at one point contending to be named the best team in the world. That this squad chose Tommey as the newest fourth man is a testament to the respect he still commands at the highest level of European Call of Duty. Tommey will be a familiar fit for most of the Splyce squad, however, having competed alongside both Dylan ‘MadCat’ Daly and Jordan ‘Jurd’ Crowley on several occasions in the past. Most recent of those was during the Black Ops 3 season, when the three competed alongside one another under Millenium, winning both stages of the European Call of Duty World League. With the trio now reunited and Ben ‘Bance’ Bance rounding out the roster, the Splyce squad boast a phenomenal mixture of raw talent, veteran experience, and a track record of success together. As Call of Duty: WWII approaches, Splyce look set to remain a formidable presence both domestically and internationally. Selecting a single greatest achievement in Tommey’s career is a difficult task. Domestically speaking, he’s one of the most successful players the region has ever seen, racking up an enormous number of trophies across multiple titles. If those were to be narrowed down to choose a particularly stand-out moment, it is perhaps Millenium’s victory at the Stage Two Playoffs of the European Call of Duty World League that stands out the most. 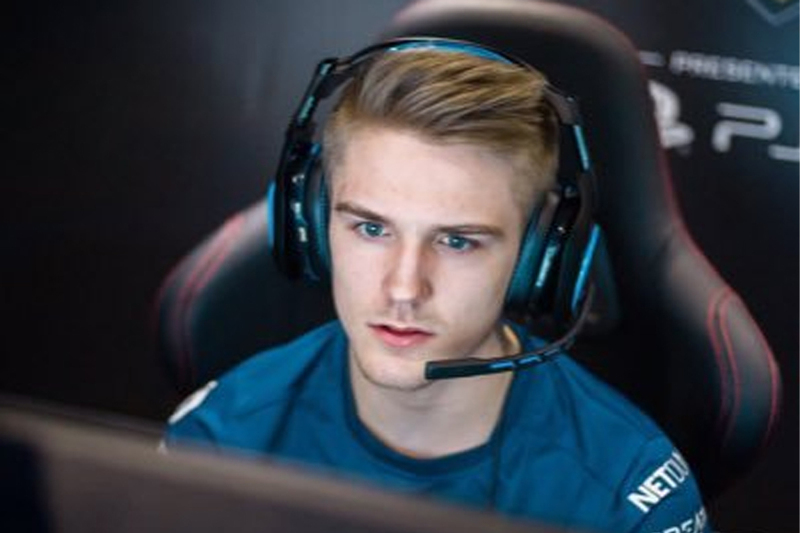 Playing with two of his recently reunited team mates in Jurd and MadCat, it marked the team’s dominance of the biggest domestic competition of the year, having previously claimed the Stage One trophy. Unlike his new team-mates, however, the one thing Tommey’s extensive list of accolades lacks is a land-mark international result. With Splyce in the coming year, replicating the team’s Global Pro League success of Infinite Warfare will be the highest priority if Tommey is to meaningfully add to his legacy. Tommey originally made his name as a high-impact player, a supremely talented play-maker capable of turning a game on its head single-handedly. He was so valuable in this regard that he earned a unique moniker, “The Game Changer”. Today, Tommey’s impact on the game generally comes in a slightly different manner. In recent years, Tommey has largely taken a step back from being the star player of his teams, in Infinite Warfare typically playing a more supportive role. It seems likely that this will remain the case for WWII, given the talent that now surrounds him on Splyce. Tommey’s in-game impact isn’t always limited to his direct actions, however. In his Fnatic squad for Infinite Warfare in particular, Tommey’s presence as a leader was crucial to the success of a team that otherwise largely lacked experience at the highest level. 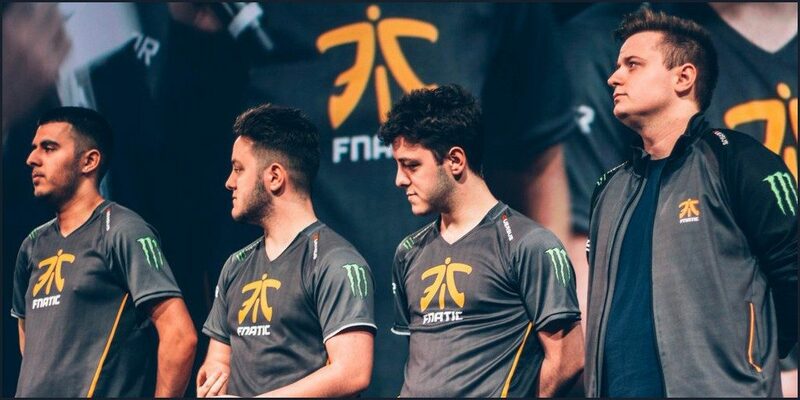 Much as in his role as a player, Tommey’s position as a leader made his greatest impact arguably the ability to elevate his fellow team-mates. As one of the most veteran and successful players in Europe, it’s no surprise that Tommey has amassed a sizeable following relative to the regional average. 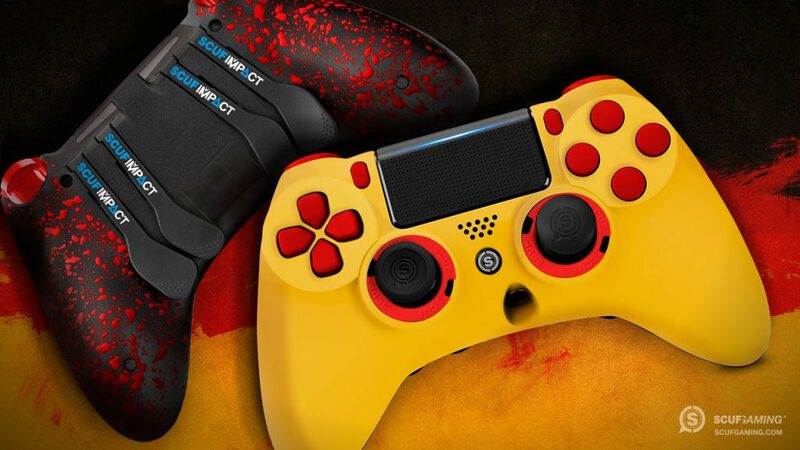 While his in-game talent is undoubtedly at the core of his popularity, however, unlike many of Europe’s elite Tommey has actively cultivated a fan-base, being active on social media, streaming regularly and even producing his own line of apparel. On stage, Tommey exudes the confidence of a champion without straying into arrogance, and combined with an easy-going and humorous attitude outside of the arena it’s little wonder he’s become such a popular and respected figure in European Call of Duty. Tommey is a worthy ambassador for both European Call of Duty and the esport as a whole. 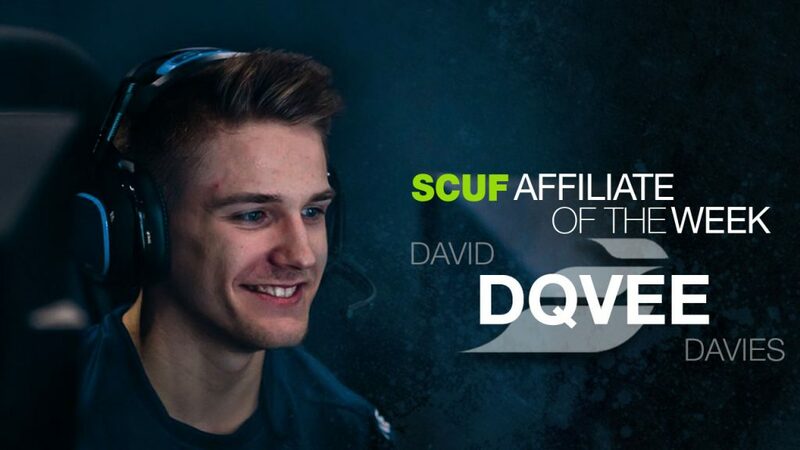 This week’s affiliate profile takes a look at one of the rising stars of European Call of Duty, David ‘Dqvee’ Davies. Dqvee’s rise into the upper echelons of European Call of Duty was remarkably swift. His first appearances on LAN would come towards the back end of the Advanced Warfare season, and although they were at domestic events of a relatively low profile, some top placements – including his first victory – were enough to see him onto a decent squad under Exertus for the start of Black Ops 3. Dqvee would remain under Exertus for the majority of the Black Ops 3 season, qualifying for Stage Two of the Global Pro League and eventually joining up with Stephen ‘Vortex’ Allen and Billy ‘Hawqeh’ Harris, alongside whom he still competes. While he was quick to break into the professional level, however, Dqvee’s rise wouldn’t take him to truly exceptional heights until the end of the season. 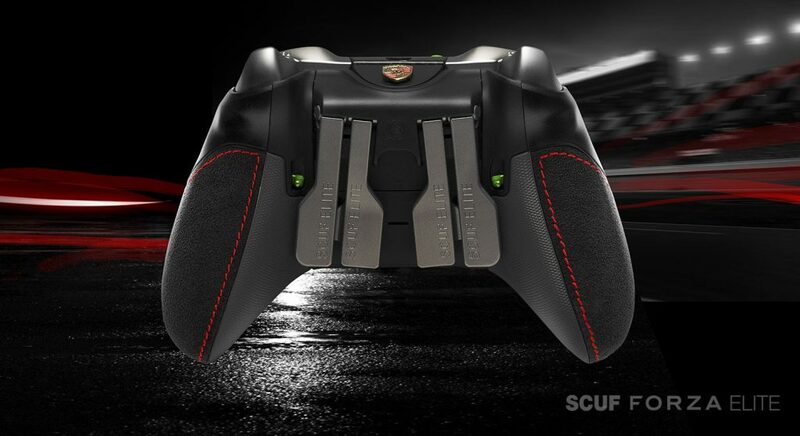 Exertus remained competitive in Europe, but were never truly challenging for titles. At the end of the year, however, the squad would throw themselves into the spotlight with an entirely unexpected performance at the Call of Duty Championships, playing this time as FabE on their way to a fourth-place finish. The squad remained unchanged for the start of Infinite Warfare, but looked in danger of slipping from their newfound spotlight following a few underwhelming results. The addition of former Splyce player Joshua ‘Joshh’ Lee-Shepherd, however, transformed them into one of Europe’s strongest teams, giving Dqvee a platform from which to shine and cement himself as one of Europe’s best players. Right now, the exact line-up for Dqvee’s current team is something of a mystery. With the Call of Duty: WWII season approaching, many teams and players have been making changes to their rosters, and while some have been revealed, Dqvee’s current status remains unknown. What seems likely, however, is that the core will remain similar to that of the Epsilon squad of Infinite Warfare. Though Joshh has departed the team, Dqvee has competed alongside Vortex and Hawqeh for nearly a year and a half, and there’s currently no indication that the trio won’t stick together for the coming season. This past year, the team under Epsilon had something of a slow start, but would ultimately solidify themselves as one of the top-two teams in Europe, only narrowly behind Splyce at times. Though they had little luck in the Global Pro League, the squad won both CWL Birmingham and CWL Sheffield domestically, and picked up an impressive third-place finish at CWL Anaheim. Though Dqvee’s most successful season was undoubtedly on Infinite Warfare, his most exceptional achievement in isolation actually came at the very end of the Black Ops 3 season, at the Call of Duty Championships. FabE’s run to fourth-place is quite possibly the greatest underdog run that Call of Duty’s most prestigious event has ever seen. Prior to that tournament, FabE, previously known as Exertus, had only once before even competed at a major international event, reaching the top-eight of the sixteen-team ESWC. The squad hadn’t even reached the playoffs of Stage Two of the European CWL, with their season’s peak a top-four at the Gfinity Summer Masters. Simply put, FabE were arguably stretching to be included among Europe’s elite, let alone coming anywhere close to that conversation in a global setting. When it came to the biggest event of the year, however, FabE showed up. Even outside of the context of their expectations compared to the result, a fourth-place finish at the Call of Duty Championships is a major accomplishment. Were it not for the even more unbelievable run of Splyce to the grand finals, FabE’s fourth-place would today still be the highest placement by a European team in the history of the event, and at the time was one of the high water-marks for the region in any international competition. This year, Dqvee really came into his own as a star player. As an AR slayer, Dqvee was capable of putting up big numbers in the kill column, an extremely valuable talent in a game that saw slaying power be more important than perhaps ever before. Many of the most successful teams of Infinite Warfare were those that could field an elite primary AR player. It was a role that ultimately proved key throughout the season, and Epsilon were fortunate to house one of the best in Europe in the position. Over the past season, Dqvee was a legitimate carry threat, capable of going toe-to-toe with some of the best players in the world and consistently living up to his status as a star player. When Epsilon saw their greatest success, it was usually behind immense performances from Dqvee. Dqvee’s rise this year hasn’t been limited to his in-game achievements. Confident, outgoing and with an easy sense of humour, Dqvee was as quick to attract fans with his appearances in interviews and on complementary shows like MLG’s “Hot Mic” as he was with his in-game finesse. With the biggest fan-bases in Call of Duty typically focusing on teams and players across the pond, Dqvee’s presence on social media is yet dwarfed by those of the North American titans, and like many of his European compatriots he hasn’t adopted the content-creation approach to building a brand for himself as many North American professionals do. When he does appear on camera, however, Dqvee is almost always to be found with a smile on his face, and never misses an opportunity to slip in a trademark wink. Bringing their “Weekend Of Intel” to a close, Activision and Sledgehammer released their mini-documentary, “Brotherhood Of Heroes”: a touching tribute to the real men and women who risked their lives during the second World War to prevent Nazi tyranny the world over, and how to create a story based around such an important moment in history. Much of the video is narrated by Martin K.A. Morgan, a World War II historian and scholar, who was instrumental in bringing the right level of honor and respect to a story that takes place during one of the most trying times in world history. “Brotherhood Of Heroes” takes you through some of the most important places and times during WWII, and shows you how the game will translate those moments. 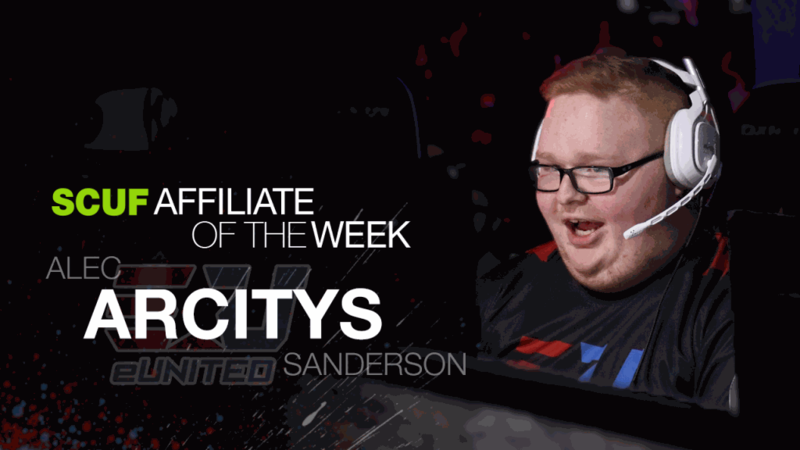 This week’s affiliate profile takes a look at one of the break-out stars of Infinite Warfare, eUnited’s Alec ‘Arcitys’ Sanderson. Despite having spent most of the past season on one of the top teams in the world, Arcitys is a relative newcomer to professional Call of Duty. Towards the end of Black Ops 3, he and twin brother Preston ‘Prestinni’ Sanderson – to whom he is inextricably linked not only by blood, but also by the fact that the two have competed together at every stage of their careers so far – made their first notable appearance on LAN with a top-12 finish at MLG Orlando under Apotheon Esports. The squad would go on to qualify for the Call of Duty Championships at the end of the year, ultimately finishing top-24 there to conclude the season. It may have been a relatively unassuming start for the pair, but in the current climate of competition exceptionally few players reach the top-twelve of a major event in their LAN debut, and reaching Call of Duty’s most prestigious event is becoming progressively tougher every year. In hindsight, their brief time competing at the end of Black Ops 3 perhaps hinted at what Arcitys and Prestinni were destined for. Their first step towards breaking into the elite came at the start of Infinite Warfare, when alongside Pierce ‘Gunless’ Hillman and Anthony ‘DraMa’ Padilla they picked up another top-twelve finish at CWL Vegas. 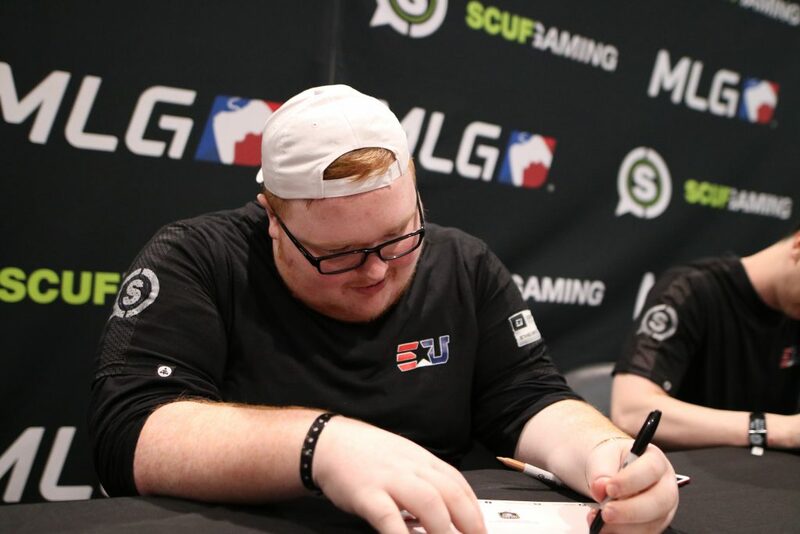 Following that performance, Arcitys, Prestinni and Gunless moved to eUnited to join up with veteran Justin ‘SiLLY’ Fargo, forming a squad that would become one of the most impressive break-out teams of recent years. 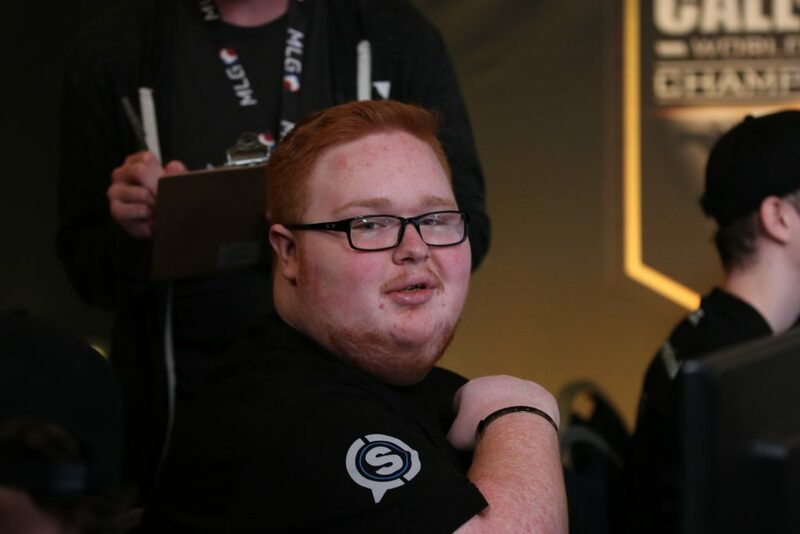 Going into the Call of Duty: WWII season, Arcitys remains a member of the eUnited squad that he helped to push to the very top of the game. It’s hard to overstate just how remarkable the eUnited team was in Infinite Warfare. Players breaking into the upper echelons of competition are not unheard of, but for an entire team of players who previously were nowhere to be found at the highest level to become one of the best teams in the world in such a short period of time is truly exceptional. Towards the end of the Infinite Warfare season, a roster change saw former star Gunless be replaced with ex-FaZe member James ‘Clayster’ Eubanks. Though the team technically saw their best results with the earlier iteration of the line-up, at its peak the squad with Clayster still looked incredibly formidable. Ahead of the coming year, eUnited seem to be one of the only elite squads not making a change, and it’s not hard to understand why. Matching the talent and chemistry that elevated the team in the first place with the experience and talent of a veteran player like Clayster is a potent combination, and one that should be expected to hit the ground running in the new season. 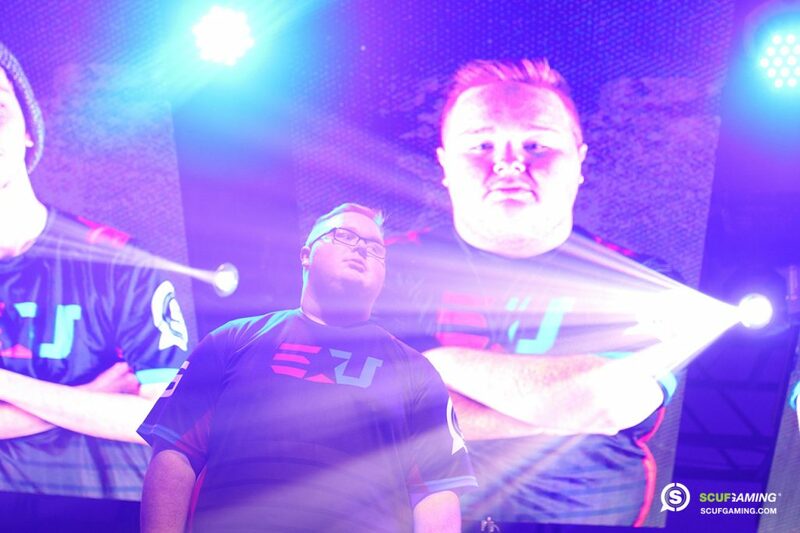 Arcitys greatest achievement is undoubtedly the meteoric rise and success he had with eUnited towards the beginning of the Infinite Warfare season. From relative obscurity, Arcitys helped launch his team into the elite almost overnight, a squad primarily made up of rookies going from having never placed higher than top-twelve to victory at the second major event of the year. Not only did eUnited lift the trophy at a major event, the CWL Atlanta, they did so in rather spectacular fashion. Their run to victory required them to battle their way through many of the top teams in the world, concluding with an epic battle against OpTic Gaming to clinch the title – incidentally becoming the only squad in the year that would beat OpTic in a grand final. Though they weren’t quite able to lift another trophy, eUnited would later prove that their break-out performance was no fluke, returning to the grand final at CWL Dallas where they once again faced OpTic in a thrilling grand final. There it was OpTic that narrowly emerged victorious, but eUnited’s performance cemented them as a truly elite team for the year. Usually, stars that rise as quickly as Arcitys has – especially during the advanced movement era – do so because of incredibly mechanical skill that marks them out as special talents. While Arcitys undeniably boasts great mechanics, what stands out in particular about his playstyle is his movement and positioning. Rather than relying on his skill to snap onto players and take fifty-fifty gun-fights, Arcitys routinely puts himself in advantageous positions by making consistently smart decisions on both a micro and macro level about his timing, positioning and target selection. These are traits more commonly found in more veteran players, and one of the reasons Arcitys stands out as a particularly exciting prospect for the future. During the Infinite Warfare season he also demonstrated a degree of versatility, making role adjustments following the addition of another primary Assault Rifle player in Clayster. Having spent a relatively short time in the spotlight compared to most of the players who are now his peers, to a certain degree the Call of Duty community is still getting to know Arcitys. 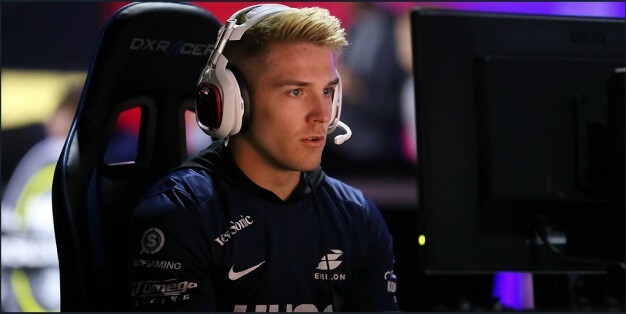 From the time Arcitys has spent in the public eye, he appears to be easy going and humble, a worthy ambassador for the game. Continuing Activision and Sledgehammer’s “Week Of Intel”, the official Call of Duty YouTube channel released two more fascinating characters in their “Meet The Squad” series. And after four American soldiers, today’s update takes on a decidedly more European flavor. The first is the mysterious Rousseau, a French resistance fighter who has found herself in the center of the fight looking to save her family. The second is British Secret Service officer Major Arthur Crowley, an expert on sabotage and deception. It isn’t clear yet how deep of a relationship we’re going to have with these new-introduced characters during CoD’s single-player campaign, but it’s obvious that CoD:WWII has a brilliant cast thus far. Perhaps we’ll get to learn about some of the villains this week? The CoD PC beta begins next week, and while it probably won’t show us much about the campaign’s cast, we can’t wait to get back into the fight. Over the years, it’s been impossible to avoid falling in love with the characters that we meet in every Call of Duty single-player campaign, and thanks to four videos released today, it’s obvious that CoD: WWII won’t be any different.Call of Duty’s official YouTube channel released four short videos today. They’re entitled “Meet The Squad”, and each one of them focuses on a different American soldier that will help tell the story of November’s highly-anticipated World War II epic. Each of the characters looks terrific, from the inspiring leader we see in Lieutenant Joseph Turner, to the grizzled veteran Sergeant William Pierson. But if we had to choose a favorite, it would have to be the young heroics of Private Robert Zussman and the spirit of the game’s protagonist: Private Red Daniels. Each of these characters looks great: we can’t wait to get our hands on them in November.